The Desert Wheatears will be participating in the race for the 4th straight year, and this time two of the group’s founding members will be joined by Shuki Cheled. It is Shuki’s 2nd race, and along with Eldad Golan and Netanel Yarkoni they hope to keep making progress, in the score sheet as well as in the final standings, and reach for the top. Eldad is 49 years old, a father of 2, living in Kibbutz Ein Gedi. Our man in the desert, and without a doubt the most irresponsible adult of the gang. His birding disease has gotten more and more severe in recent years, and these days he is living the dream and working professionally as a part time birder. He loves watching birds, photographing birds, talking about birds, and even writing about them – as you can all read in the SPNI’s birding portal. The founding captain of the Desert Wheatears. 31 years old, married with 2 kids, lives in Modiin. 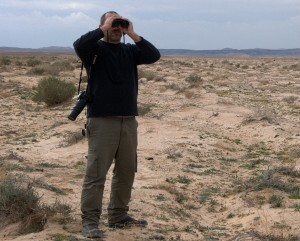 A knowledgeable, experienced birder, who combines his love for birding in the field with tons of theoretical knowledge about birds in Israel and abroad. Naturally he is the team’s chief strategist, and if we are to follow his renowned optimism, this year the sky is the limit (or at least 170 species). 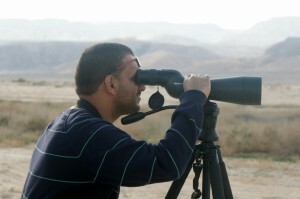 Shuki is an avid birder, a gifted photographer, and is a great nature-lover. This is his second race, and he is sure to help the team reach respectable results.